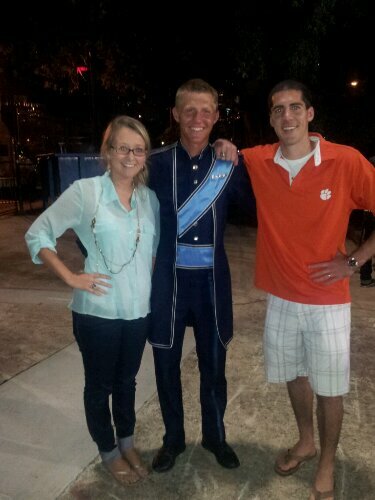 This weekend my husband and I drove to Charlotte, NC to see his brother play in a marching band competition. 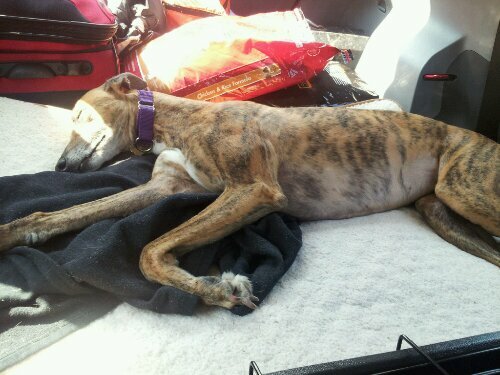 Cleopatra got LOTS of attention at the flea market- all that adoration sure can tire a diva out! If you have any good memories of random places you stumbled upon like that, do share!! Anyway husband questions aside- I can’t wait to hang this on a wall! I’ll share pictures of course! If you read my overly pin-punny post last month, then you might remember that this summer I have teamed up with 2 other bloggers- Katie at Dates with Drywall and Ashley at The Vegetable Life– to host a summer “Pinspiration Party”. This party has one mission: LESS PINNING, MORE DOING! We were all supposed to take one “pin” that we have been inspired by and ACTUALLY DO IT… shocking concept, I know. 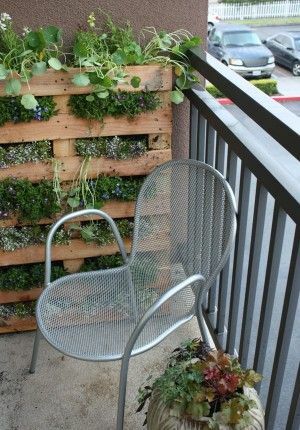 Hopefully you checked out Katie’s featured post about her pallet garden. 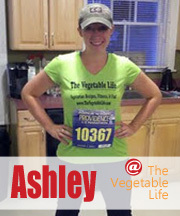 And next month, Ashley will have her pinspired project complete, and I will give you a peek at it here on my blog. Well July was my month to complete a pinspired project and after weeks of pincrastinating (does that work, no? ok) I finally have something to show for my hours upon hours of pinning! Well, I got this bench for $10 from a local thrift store. 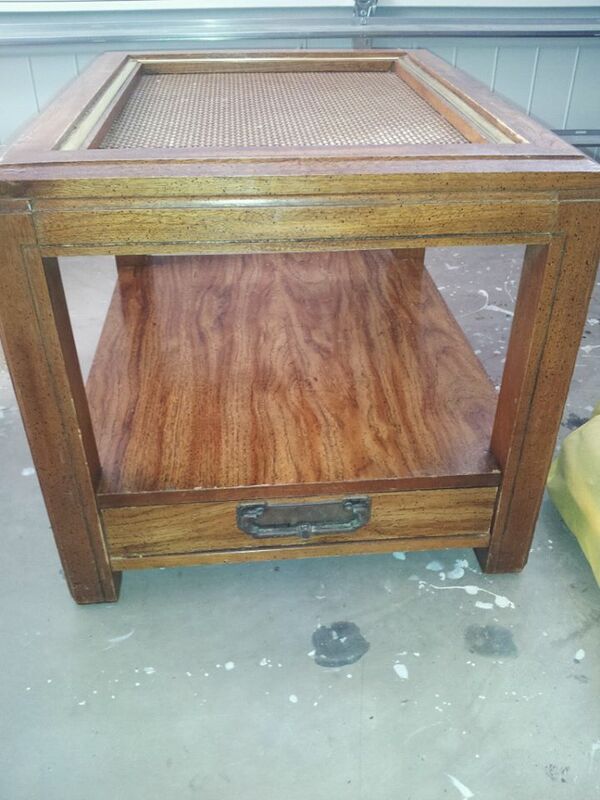 It had great, solid wood legs, but the top was particle board and had some damage. I had it for a few days before I really knew what I was going to do about the top. 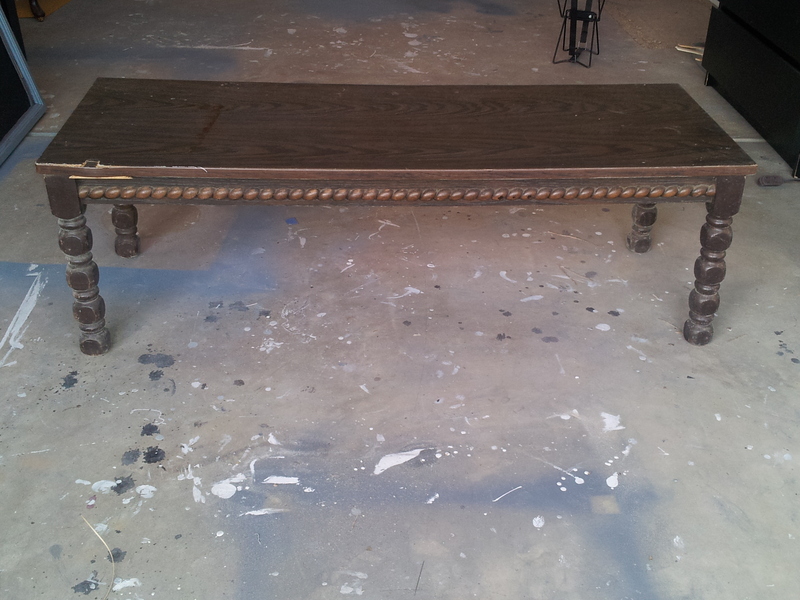 First, I unscrewed the top of the bench. 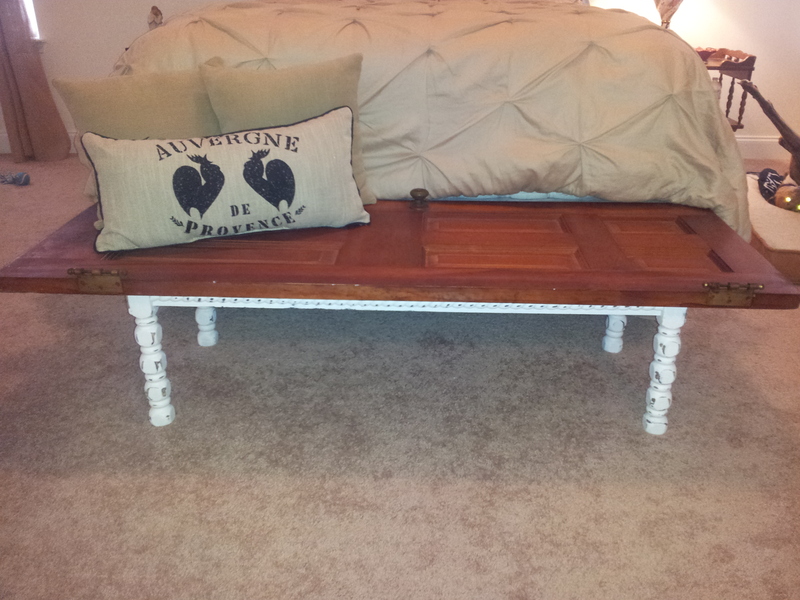 Then, I primed and painted the legs white- Behr Cotton Fluff. 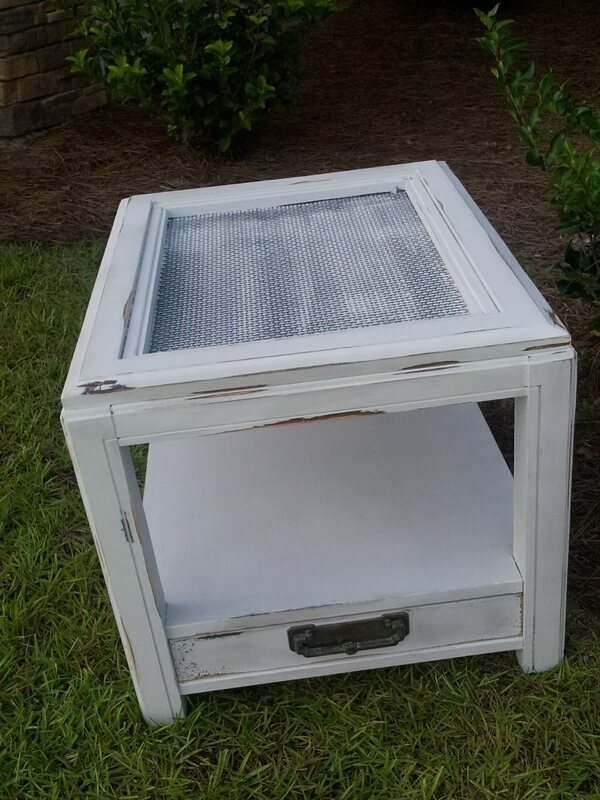 I attached the door using the same holes and screws that held on the original bench top and then, distressed the legs using my B&D Mouse Sander. She is perfect for the end of our bed! 🙂 I am so happy with how it turned out! 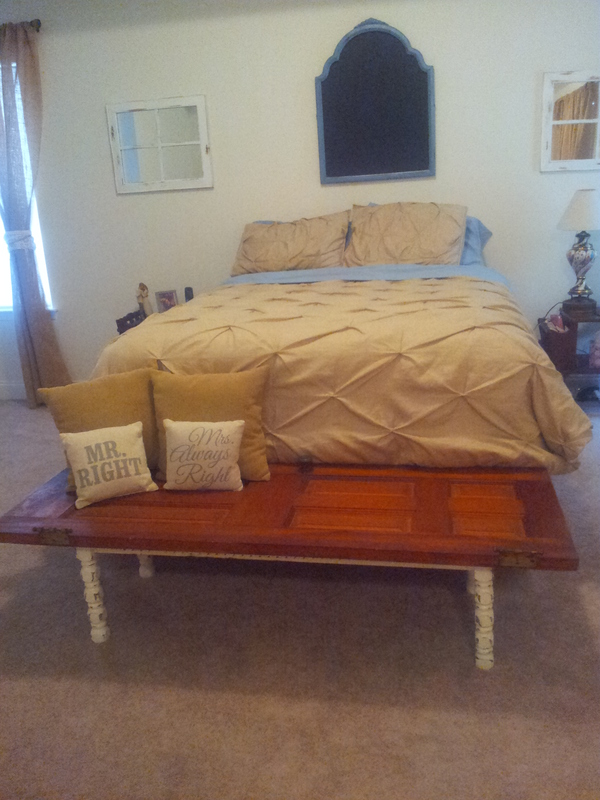 It was cheap ($10 bench + $10 door = $20 bench) and SUPER easy!!! See Cleopatra all stretched out in her bed? She is one chillaxed dog! 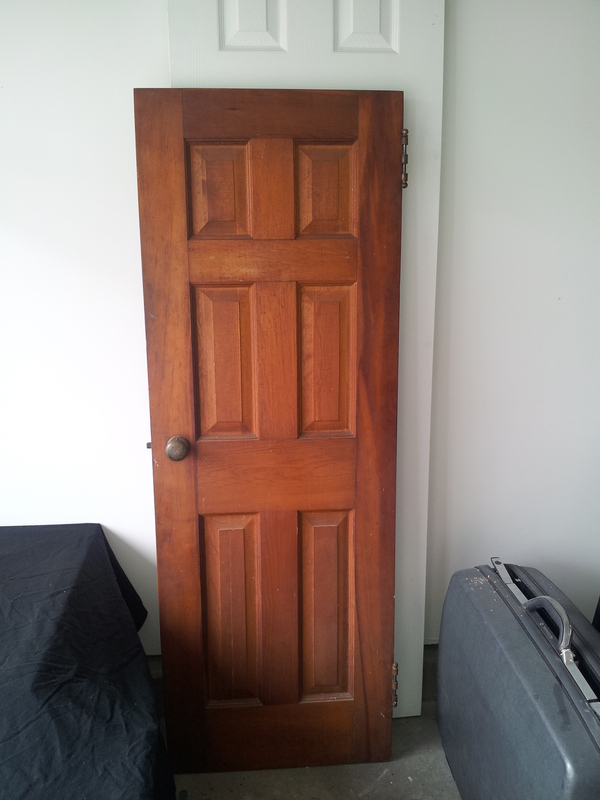 What would you like to do with an old door?? Let me know your ideas!! Side note: After writing this post and that little spiel, I have decided to try to be more scheduled about my posts. I think I will try to release a new post every Friday… and a “bonus” day in between if I get too impatient. As a reader, do you like a more scheduled blog? Let me know! To paint it I first had to take the hardware off and then, prime the whole thing. I had to use a primer suitable to all surfaces since this had wood, composite, metal, whatever that woven stuff is, etc. 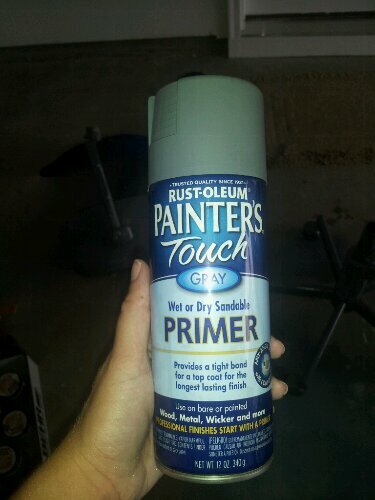 Usually I use Zinnser’s Bulls Eye, but this time Rustoleum Painter’s Touch spray primer in gray did the trick. 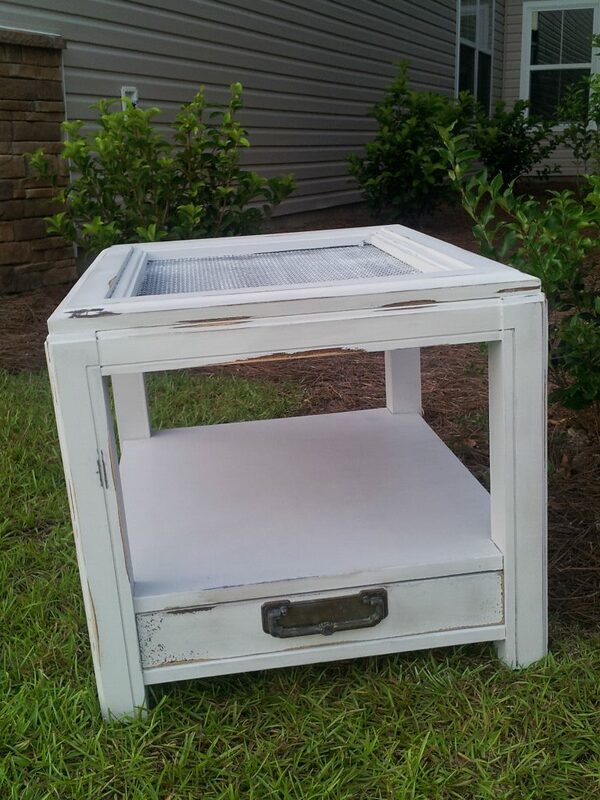 I then painted it with regular old Behr latex paint in “Silver Screen” that I had on hand. I didn’t cover all of the woven looking top with white, I let some of the gray show through there to give it some dimension and contrast. 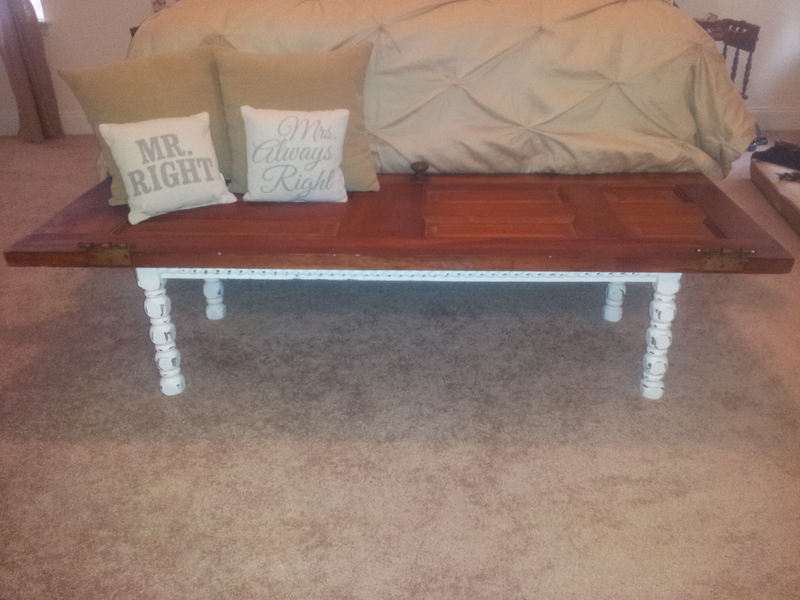 Distressed the edges with a sander, popped the hardware back on and she was ready to go on Craigslist. This table was a freebie, and I used materials that I had on hand so this is really a no risk way to try to make a little extra money (that I just put back into materials and new pieces, generally). 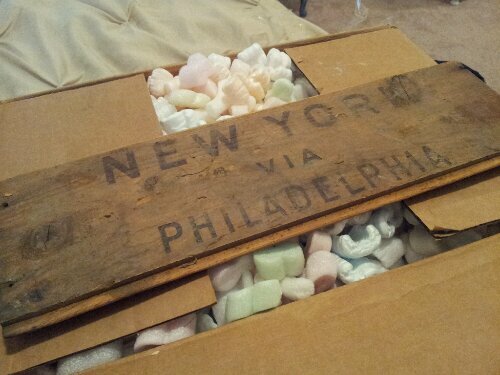 NOTE: The paint job on this piece had a lot of blemishes. It was hot and the paint was drying too quickly. To remedy this problem I added Floetrol (less than $7 in the paint section at Home Depot) to the paint before I did the second coat. It mixes in with the paint to extend dry time and make it go on smoother. My second coat went on like butter and I was able to hide a lot of the imperfections that way. What I can’t hide with a second coat of paint- that’s where I always start my distressing and sand all those little oopsies away! It doesn’t have to be perfect- don’t stress, DISTRESS! Seriously, let me know what you think about that whole scheduled posts debacle! What do you like better- sporadic posts when the content is there, or more scheduled posts (like one day a week)?! 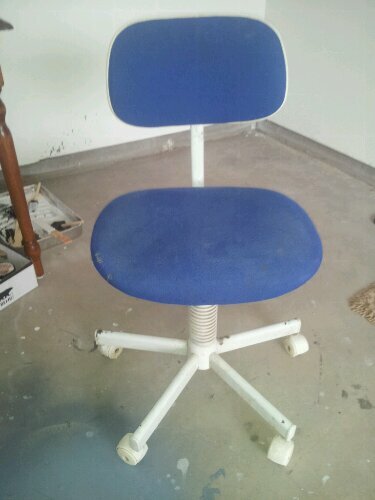 I found this old desk chair left out on the curb for trash collection a few weeks ago. 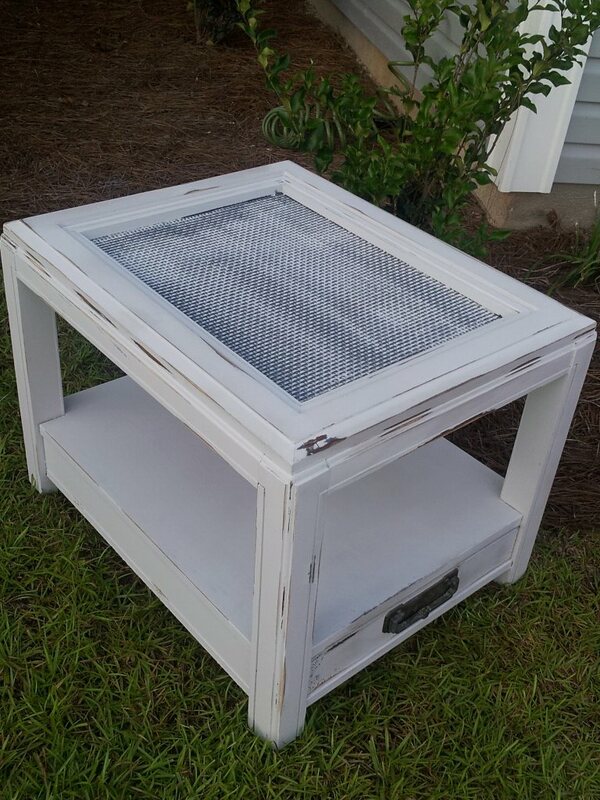 It was stained up and a little rusty, but still sturdy… and free, which made it the perfect candidate for a trashy to classy makeover! Then I used burlap and a staple gun to recover the seats. I used hot glue to reinforce the edges. 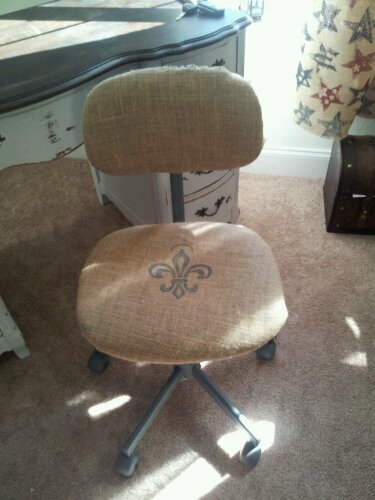 I used a stamp and some blue paint to add the fleur de lis and she was done!! I think I could be inspired sitting at a desk with this pretty little chair, how about you? I’ve decided to start myself a little series called “Trashy to Classy“, at least for now. It’s not going to be scheduled or anything because I’m too impatient and disorganized for that, but it will feature makeovers done with items that I found in… you guessed it… the trash. I am constantly finding things sitting on the curb on Monday nights before trash day… reusable things that are otherwise doomed for the dump! So I’ll grab them and fix them up and make them over! (Sometimes I even make a little money!) And it keeps this stuff out of the landfill. I grab big things that are on the curb, like a fountain, door, table, chair, mirror and hardback suitcase so far, so no, I’m not digging through anybody’s trash. 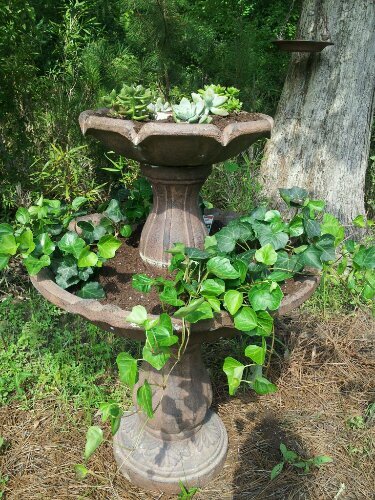 Just had to drill holes in the bottom, glue some pieces back on, add soil and plants and… Presto chango- trashy to classy! 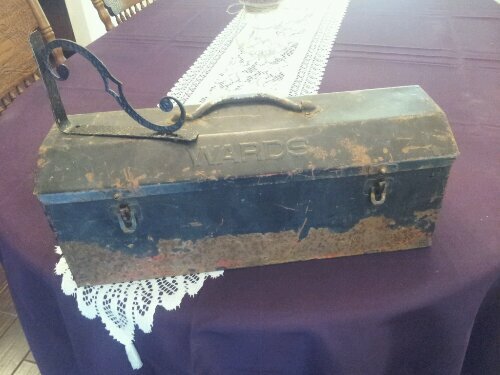 So what are your thoughts on grabbing trashy treasures from the curb?!? Guess what?! 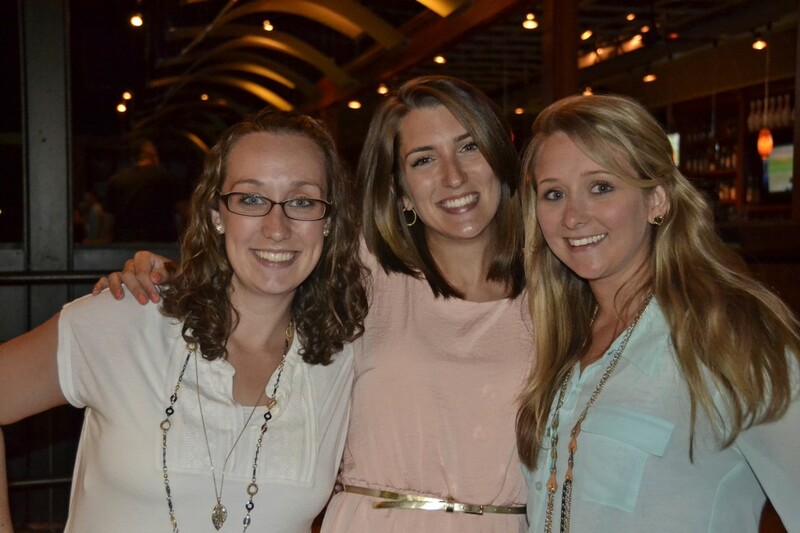 You’re PINvited to a summer PINspiration party! 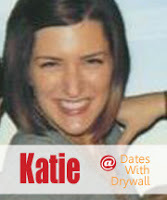 I’ve joined forces with two other AWESOME bloggers, Katie (one of my great friends from high school and the mastermind behind dateswithdrywall.com) and Ashley (Katie’s college roommate and the foodie behind thevegetablelife.com) to host this virtual par-tay! Here’s how it works: Each of us picked a month where we PROMISED we would do “less pinning, more doing” and pick one “PINspired” project (aka one we found on Pinterest) to tackle that month and feature on our blogs. I’ll be sharing my project and I’ll also be sharing Katie and Ashley’s projects- so you don’t get bored with my same old style. Katie took June (keep reading for her pallet garden experience), I took July (I have no idea what I’m doing and the month is 1/2 over… shhh! Don’t tell!) and Ashley took August (she already knows she is going to do a pantry reorganization project, so be on the lookout for that)! Last Minute Decor for July 4! If you are anything like me and you have a bad habit of forgetting what the date is and letting important events and holidays sneak up on you than you probably haven’t put out any 4th of July decorations yet. Heads up… it’s tomorrow! 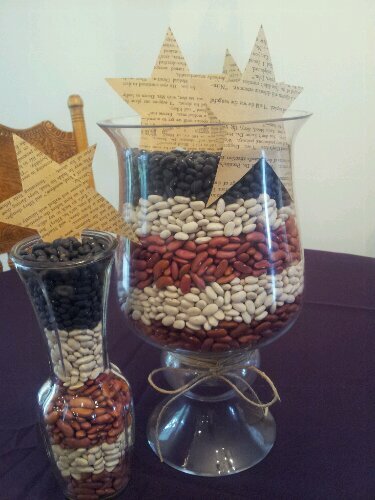 Just take dry kidney beans, white beans and black beans and layer them in a vase to create a beautiful flag effect. 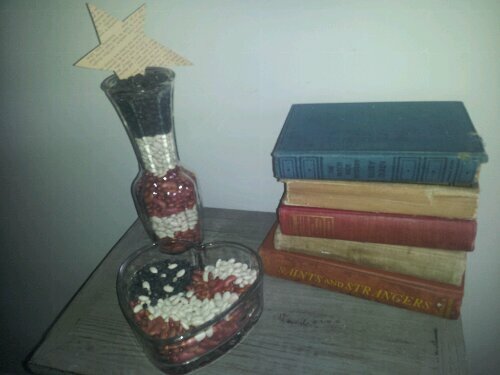 I used old book pages to cut out stars but you can be creative! Hope y’all have a happy 4th!! PS: Look at this beauty Ben and I rescued from the curb on our Monday night walk with Cleopatra. 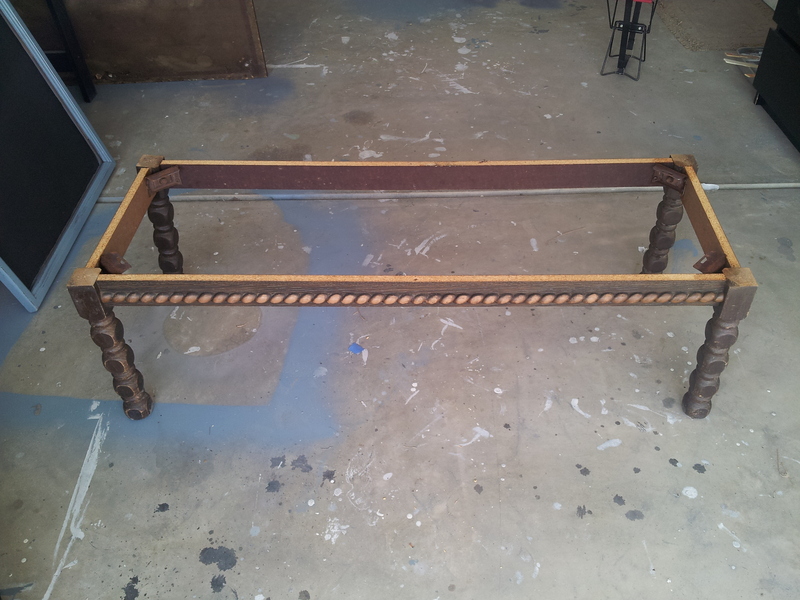 The decorative piece on top was broken off but the rest was still in great shape with so much potential! 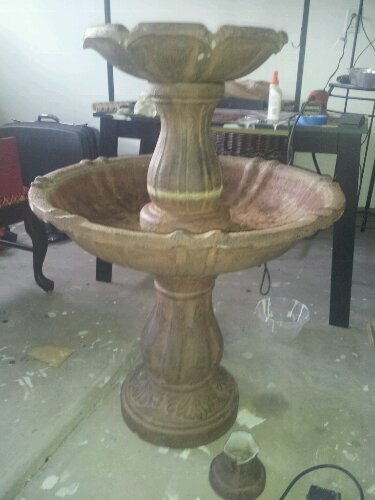 We are thinking of making it a planter… Any other ideas?